Hydrate, hydrate, hydrate wherever you go with your CamelBak KickBak Tumbler. 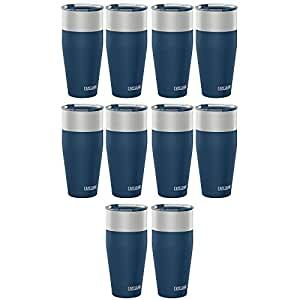 Great for coffee, tea, water, or even an adult beverage, this vacuum-insulated tumbler keeps your drinks cold up to 8 hours or warm up to 4 hours. Crafted out of 18/8 stainless steel, you don’t have to worry about your afternoon teas ruining the taste of your morning coffee as it doesn’t absorb taste or odors. It is also 100% free of BPA, BPS, and BPF. Because it fits in most cup holders, you can take your favorite beverages in your favorite CamelBak KickBak Tumbler wherever you go.